Check out the tabs above for more information! 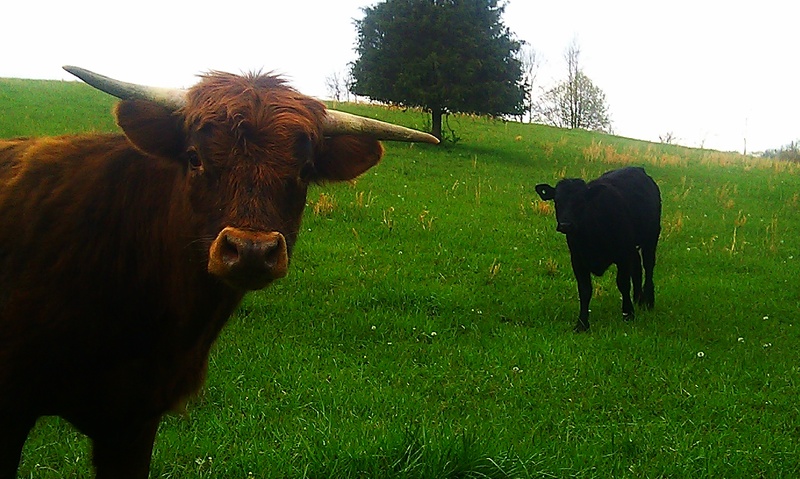 Why Should we Buy Grass-Fed Products? Meat from grass-fed animals has two to four times more moega-3 fatty acids than meat from grain-fed animals. Omega-3s are called “good fats” because they play a vital role in every cell and system in your body. People who have ample amounts of omega-3s in their diet are less likely to have high blood pressure or an irregualr heartbeat. Remarkably, they are 50% less likely to suffer a heart attack. Meat from grass-fed beef and sheep is lower in total fat. Research shows that lean beef can actually lower your LDL “bad” cholesterol. People with a diet rich in omega-3s are less likely to suffer from depression, schizophrenia, attention deficit disorder (hyperactivity), or Alzheimer’s disease. Animal studies show they might slow the growth of cancer. Meat from grass-fed ruminants are the richest known source of another type of good fat called “conjugated linoleic acid” or CLA. When ruminants are raised on fresh pasture alone, their products contain from three to five times more CLA than products from animals fed conventional diets. CLA may be one of our most potent defenses against cancer.